"Hello ma'am/sir, Welcome to Pedia Ward. I'm Princess, your daughter/son's nurse from 7 in the morning until 3 in the afternoon." So as I said, I will wear my white uniform and white cap... again. My 45-day challenge has just began and my first rotation would be in the Pedia Ward. Lovely great! The area I super least like to be assigned at. A big challenge for me, indeed. Honestly, I don't like kids when they get sick. Their annoying cry. Noncompliance to medications like if you will give their due meds, they would start sobbing. Some would pretend they are sleeping. Some would even throw the meds at you or the worst, spit at you. 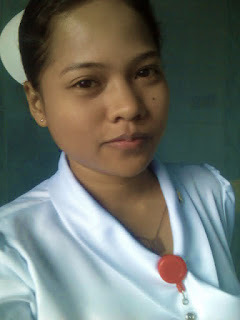 The first 2 days, I was with my head nurse. Basically, he gave me orientation as to the hospital policy, the protocols in the pedia ward, and how to work productively in this vicinity. He also taught me how to be a Charge Nurse and the role to be one. On the 3rd to 5th day, I was with my preceptor and I'll be with him until the end of the 45-day challenge. Fortunately, my preceptor is nice and all. I like the way he guide and teach me on what I must do during our duty. Whenever I ask him questions, he will give me direct and simple answers. I am his first nurse trainee to supervise. I am not sure with the other preceptors but I must say, I'm glad to be under Sir Nath's supervision. So my week One. It was sort of the adjusting phase for me. I need to review everything about nursing like how to get the vital signs (blood pressure, temperature, pulse/heart rate, & respiratory rate), monitor input and output, regulate the intravenous fluid, prepare medications, write nurse bedside notes, and etc. I guess 5 months of living a bum life made my neurons go dry. I'm happy for you! great experience yan!! :) Ako naman gusto ko ng mga batang may sakit..mas madali kase sila entertain at utuin..heheh kapag nasa hospital...hahhahaha :) good luck! !